Matcha's ingredients boost your metabolism, inhibit fat absorption and act as a natural detoxifier - natural weight loss! Matcha releases energy slowly and natural over 4 - 6 hours. No more spikes and troughs, no more jitters. Matcha has 137x the antioxidants of standard green tea. These fight cancer, high cholesterol and aging. Matcha has been shown to improve mood and concentration as well as fight Parkinson's and Alzheimers. So what is matcha? Zen Green Tea’s matcha starts from our green tea plants grown on the slopes of Kyoto, Japan. Its incredible health benefits come from the unique process in which the tea leaves are shaded, hand picked, strictly graded and then stone ground into a fine, vibrant green tea powder. The result is a premium green tea with 137x the antioxidants of standard green tea. What’s more, each cup delivers the same energy as a cup of coffee but smoothly, over 4-6 hours – no spikes and slumps – with only 1/10 of the caffeine. Our Japanese matcha comes in one, simple and delicious premium grade with a no questions asked 90 day money back guarantee and free shipping to all of Australia – to understand why Zen’s 100% stone ground tea was featured on My Kitchen Rules as the “best in Australia” why not check out our free matcha buyers guide. People often wonder how to make matcha green tea. It’s simple! Just add a 1/2 teaspoon of our premium Japanese matcha powder to a cup of hot water and watch it dissolve quickly and easily to form a gorgeous, non-bitter, vibrant green tea. On the run? matcha tea bags make the process even easier. 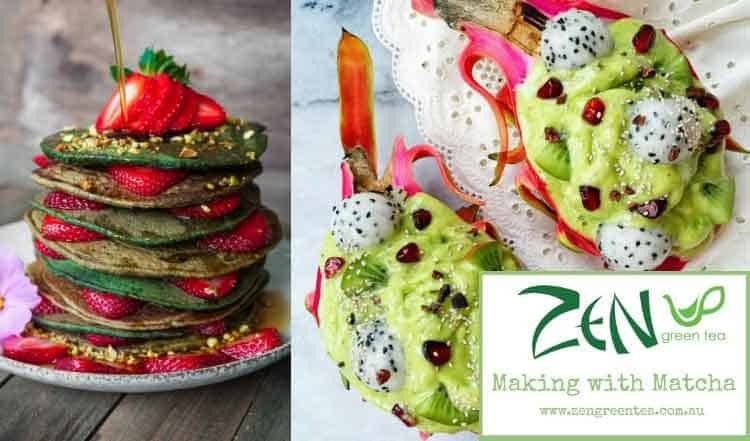 For some great examples of how to use matcha – from refreshing iced tea or delicious smoothies to granola bars or lattes – why not check out our matcha recipes? 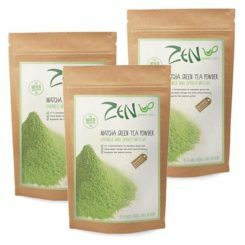 "I am hooked on Zen Green Tea! It has a smooth taste and is not bitter at all. The matcha is high quality with its the vibrant green colour and fine texture. It is easy to prepare, and to use in food as well as drinks. Its great at helping me concentrate and stay focussed, and also keeps my hunger at bay. This is my green tea of choice…no more tea bags for me!" "I first fell in love with Zen Green Tea as I was a pretty intense coffee drinker, but I wanted something that would give me an energy lift and help my concentration in the afternoon but without the caffeine jitters and impact on my sleep. 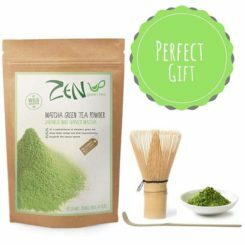 Zen Green Tea Matcha really did the trick, it gives me energy without feeling frenetic, and tastes so much fresher and less bitter than loose leaf green teas like Sencha." "I have always loved tea but generally have stuck to English Breakfast tea with sugar. I started to find myself craving the sugar hit each afternoon so I would have a cup of tea but then have a big slump afterwards. After a recommendation by a friend I tried Zen Green Tea and loved it instantly. I still get the energy boost but there is no slump afterwards plus it is something that I can drink all year round. I love to carry a bottle of ice tea with me to sip throughout the day and then have a warm cup of tea after dinner. My energy levels have never been better! ".